Yung Chin, a famous bowmaker in NY once said, he had never seen a bow with a full curve that sounded good. A full curve is when a stick touches, or even goes through the hair, when the bow is not tightened. A bow with a full curve will usually bounce very enthusiastically. Some bowmakers give a weak bow more curve to increase the strength in the vertical direction. It works, but this increases the danger that the bow will break out to the side. So in fact the bow loses lateral stability with too much curve. I never give my bows a full curve. I prefer to give them more lateral stability than bounciness. Also, the sound gets harsher with a lot of curve. 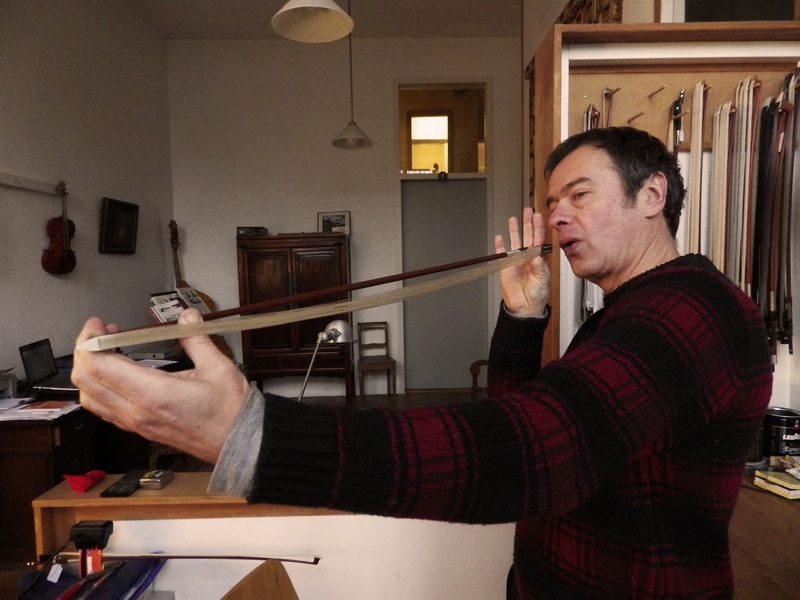 When we want a deep warm sound, a bow with less curve will provide that more easily. When I have a stick that is very elastic (high Lucchi readings), there is enough springiness in the wood that less curve is better. If the Lucchi readings are low, let’s say between 4500 and 4800, then a nearly full curve can give it some liveliness. This is what I can say about the amount of curve. Normally the curve is a hyperbola, which means there is a lot of curve behind the head and towards the end of the stick, it diminishes in a logarithmic way. In other words, we have a lot of curve at the tip and only a little curve at the frog. In earlier times the deepest point of the curve was about in the middle of the stick. I think it was Voirin, who, in about 1860, moved the deepest point further to the tip. In centimeters: the old school, for example, Peccatte had the deepest point between 30 and 35cm and Voirin between 20 and 25cm. In fact, this makes a completely different bow concept! Not because of the curve itself, but because the stick is tapered, it is thicker at the frog and thinner at the tip. The thickness of the stick has a strong relationship to the curve, because the vertical stiffness of the bow is a combination of the amount of curve and the thickness of the stick. This is important, if you don’t understand it, read it again please. If you still don’t understand? Then call me. Or, stop making bows. Maybe you are good at something else 🙂 . Sorry, that wasn’t very nice. But, be aware that this is one of the most crucial things in bow making. You can make an ugly head and a crooked frog, but if you have a good ratio between diameter of the stick and the curve over the whole bow, the bow will play well. This is because the force is spread out evenly over the whole stick. You can test it when you tighten the bow until it is straight. But, I don’t recommend you do this, because if you give the bow too much tension the head could break off. In theory it shouldn’t, but it has happened to me. There is also a safe way. You hold the stick with both your thumbs on the underside of the bow, between the hair and the stick. And then the thumbs press against the stick and giving the tension. You then can look over the length of the stick and see if it straightens. When a musician is unhappy with a bow, this is the first thing I check. To improve the bow a lot, it is sometimes enough to add or take out some curve in one place. 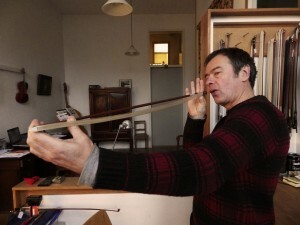 Anyway, about the measurements, a violin bow has a diameter of about 5mm at the head and 8.5mm at the frog. It all depends on the wood used. 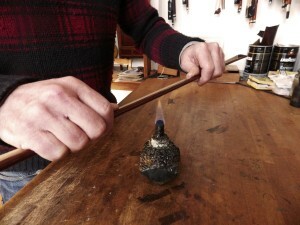 With a hard wood you can make the bow a little thinner; a soft stick you will leave it a little thicker. Hard and dense wood is preferable, because you have more possibilities to choose from. A softer stick needs a fuller curve and bigger diameters, but it can also have its advantages. A soft wood can make a friendlier bow with a full and deep sound. Gut strings, especially, work better with a lighter and softer bow. There are no ideal measurements and no ideal curve, but there is an ideal relationship between diameter and curve. The strength of a bow is a combination of curve and diameter in every spot over the whole bow. At the tip you have more curve and less wood, at the frog less curve and more wood. Voirin pushed the deepest point of the curve towards the head. He obviously made the bow very thin in that area, which results in a bow that is light at the tip. The balance point comes back towards the frog. These bows have the advantage that changing strings is faster. Paganini, which was the music of the time, becomes playable. Peccatte had the deepest point closer to the middle of the stick. His bows often have a big and warm sound, but are a little slower in their reaction. Technically, the Voirin bows are easier, but the sound is more silver than gold. My bows in comparison are like lead and copper. Not true, I know.